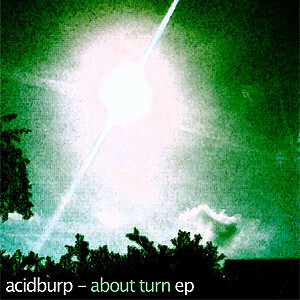 Melodic, emotional, and optimistic are all words I'd use to describe Acidburp's latest release "About Turn EP" out today on the relatively new Maltese netlabel Complex Sound Sagacity. As stated in a previous Brainchops article about Acidburp back in April, his sound conjures up the same feelings we got from IDM in the early '90s while also staying updated and freshly inspired. Title track "About Turn" starts the 4-tracker right off with some bouncy, resonant patterns, a quick acid bassline, and an uptempo beat that makes you want to dance. Though the artist sometimes incorporates acidic sounds in his music, labeling it as acid would be grossly incorrect. The intro to track 2 "Shark Delivery" features a lovely piano delay that reminds me a bit of his older track "Acidsnore" from The End or "On" by Aphex Twin, but then one of those signature Acidburp science lab synth sounds comes in and leads you down a melodic road away from any pre-conceived notions. The EP climaxes with track 3 "How Now Brown Stout", where he slices and intertwines some really cool textural percussion with a DnB style beat, and surrounds it with layers of schizophrenic synth and bassline bursts. "Wasp Incident" is a beautiful come-down with warm, dreamily filtered sound waves and a fun Moog-ish Flight Of The Bumblebee moment that may have something to do with an actual "wasp incident". A little more low-end throughout could have given these tracks bit more "umph" but the lack-of provides a light, happy feel we've come to know from Acidburp that keeps us coming back for more. Hopefully "About Turn EP" is a sign that there IS more on the way, and you can bet we'll be all over it if and when it happens.